The centerpiece of Max Fisher's Washington Post article is a map superimposing early protest information on a map of results from the 2010 presidential election, in which the now-ousted Viktor Yanukovich won a majority over opposition candidate Yulia Tymoshenko. Although Fisher did distinguish in the map between regions voting overwhelmingly for one candidate and regions where the winner received a narrower majority, the sharpness of the east-west division is badly exaggerated by the colors he chose. Using orange for Tymoshenko and blue for Yanukovich was normal, but the regions with highly-mixed results should have used some color in between. Instead, the map uses light orange for small Tymoshenko victories and light blue for small Yanukovich victories, making regions that actually weren't far apart in their votes still look sharply separated due to the clashing colors. CNN's equivalent map is even worse, using bright red and bright blue. With eye-grabbing, clashing colors like that, it's no wonder someone might think Ukraine is literally bisected down the middle. But that's just not the reality. As the map above shows more clearly, many regions, including even some in the west, voted only narrowly for one candidate over the other. The colors don't transition perfectly smoothly from one end of the country to the other - every region went to one candidate by at least 10 percentage points - but there's not a sharp dividing line either. A more detailed map, with the districts of each region separately colored, would probably show an even less distinct divide. So how well do the 2010 election results map to the current crisis? Not too badly. The Lviv region did end up taking a leadership role in the protests against Yanukovich, and Donetsk has been among the forefront of regions opposing him. However, protests did eventually spread across the whole country by February, and there were some exceptions to the yellow vs. blue pattern. If you'd like to make a detailed comparison, check out our political overview map report for the Ukraine crisis, accessible to premium members or by individual purchase. Ukraine is even less clearly cut in half by language. Map by Evan Centanni. Both the Washington Post article and the CNN post also feature maps of the languages spoken in Ukraine. CNN does better on this than on the election map, at least choosing somewhat similar orange and red colors in an attempt to show the gradient in the proportion of Russian speakers across Ukraine's regions. The Post's Max Fisher, on the other hand, continues with the misleading contrasting colors, cutting Ukraine simplistically into an orange half and a blue half for the Ukrainian and Russian languages. Most egregiously, Fisher's map uses the label "Predominantly Russian-speaking" to blanket a number of regions where there are actually more native Ukrainian speakers than native Russian speakers. 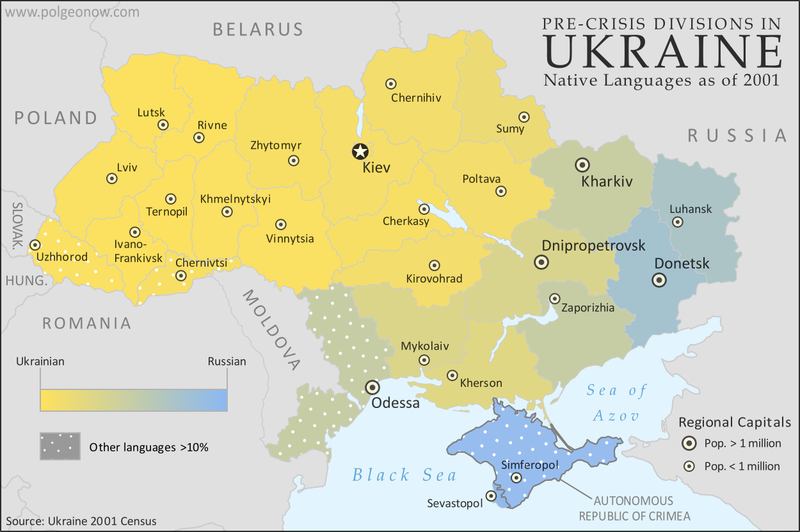 As the above map shows, Ukrainian is actually the majority language across most of the country. Only four regions - Donetsk, Luhansk, Crimea, and the special municipality of Sevastopol - have more Russian than Ukrainian speakers. When comparing this map with the election map at top, it becomes clear that language is not as great an indicator of Ukrainian politics as some commentators imply. People whose mother tongue is Russian make up only 30% of Ukraine's population according to the 2001 census, yet Viktor Yanukovich received more than 49% of the national vote in 2010 (as compared with Tymoshenko's 45%). Another fact left out of the Washington Post and CNN maps is that Ukrainian and Russian are not the only major languages in Ukraine. Although they are by far the most widely-spoken nationwide, within several regions there are other languages which come in second or third. By now many followers of the news know that Crimea has significant population of Crimean Tatars, who speak a language related to Turkish. In the Crimean autonomous region, speakers of Crimean Tatar (11%) outnumbered speakers of Ukrainian (10%) in 2001. But Crimea isn't the only region with major minority language communities. In Chernivtsi, Romanian (12%) and Moldovan (7%) both outnumber Russian (5%), and in nearby Zakkarpatsia (capital: Uzhhorod) 13% of residents are native speakers of Hungarian. In Odessa, Ukrainian and Russian are the biggest languages, but Bulgarian (5%) and Moldovan (4%) are also present. (Data from Ukraine's 2001 census, retrieved here). 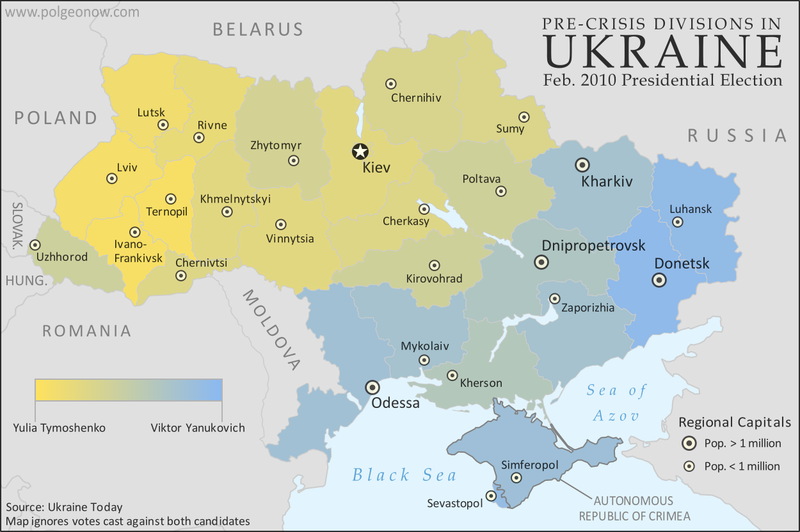 Want to see a comprehensive map of political control in Ukraine's crisis from January up to this week? Purchase our premium map report for just $5.99. Or you can become a member, and get access to all our premium content!